The Colliwat Collation: I've been fleeced! At least a year ago my very thoughtful mother-in-law had heard me mention that I would love a spinning wheel. Really, I liked the fairy tale idea of having a spinning wheel in the corner as homage to the likes of Sleeping Beauty or the ever-important and oft-forgotten housewives of yesteryear and didn't give much thought to actually using one. So when she told me she had one for me I was immediately both excited and intimidated by the prospect. As it turns out the wheel was my step-grandmother-in-law's or something convoluted to that effect. Anyhow, the onus I felt to actually use it one day became even greater knowing that a relative, no matter how close or distant, had once owned and used it. After receiving the wheel it didn't take long for my curiosity to urge me to give the dusty timber a good oiling which brought out the beautiful hues of the wood. Then came my introduction to a whole new vocabulary, a language drowned out by the din of the industrial revolution, yet still lingering faintly in nursery rhymes and folklore. So I began reading about maidens, niddy-noddies, the mother-of-all and the like in order to put the wheel together in some sort of working order. That accomplished and me satisfied that I could make it work one day it promptly found its place in the corner, albeit in the front room for visitors to catch a glimpse of it as they came into the house. 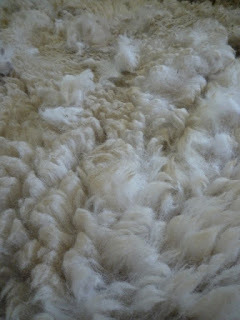 The problem was finding fleece. I trawled through various supply stores all of whom seemed to only supply ready-spun yarn or at the best very expensive rolags (there's another word for you!) or bulk supplies. This in combination with the sense that if I was going to learn to spin I'd want to do it right from scratch, kept me waiting for some other opportunity. When the spinning wheel in the corner had become no more than a niggle in the back of my mind my intuitive sister remarked that the lady she from whom she had bought her chickens had recently shorn their newest baby alpaca and was selling the fleece. Perfect! 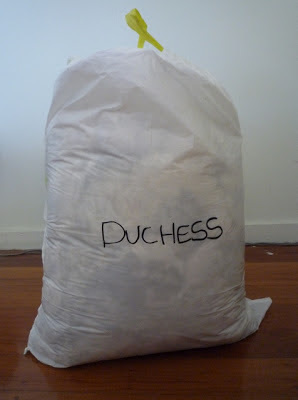 Even more perfect (evidently that's possible) that she was coming to Brisbane soon and could deliver the fleece to my sister. The fleece arrived and yesterday I began the mammoth task of learning another new language or rather new meanings for well-used words - the language of fleece preparation. Without a fleece table I decided my lounge room floor would have to do for skirting (picking twigs and hay out of the fleece), then picking (fluffing up the fleece and picking out all those bit of grass that you thought you got when you skirted). As it turns out this process can take quite a while especially when you're learning in between about the different parts of the fleece like staples and blankets and trying out different techniques. 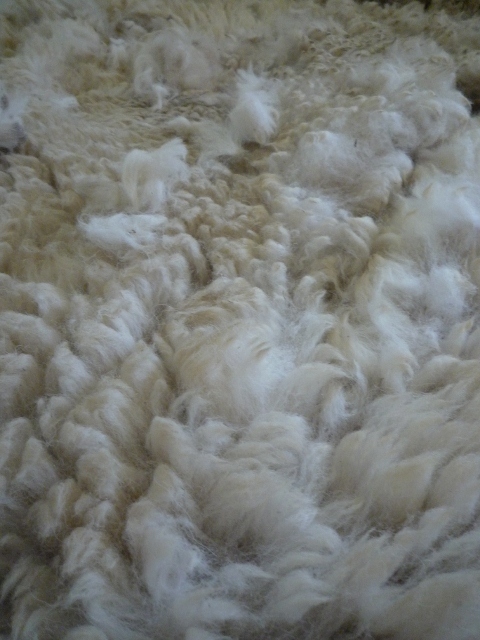 In its current mid-picking state the fleece seems to be scudding across the floor like little clouds. 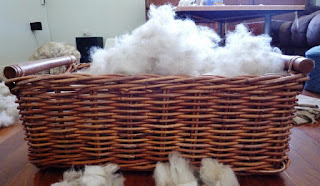 My washing basket is full of picked fleece appearing as if I've managed to stuff one of the clouds into it ready to pull out later when we haven't had enough rain. Perhaps it will be a rainy day when I finally get to the next step: carding. so... how is the carding going??? I've recently put my spinning wheel back together after it being in storage for about 25 years... keen to get back to it too!!! Still snagged on the carding unfortunately - having trouble finding paddle dog brushes and don't really want to fork out $60 for proper carders in case I'm hopeless at it and never do it again. That said, mum did recently get hold of some ready-to-spin fibre so I'll try to have a go soon and I'll make sure to post about it for you. Have fun getting back into spinning!